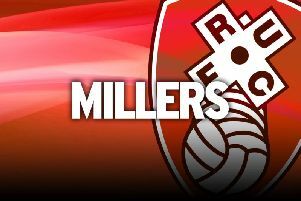 Rotherham boss Paul Warne is confident he will be able to get through the January transfer window without losing Semi Ajayi – unless there is an offer too good to refuse. Ajayi has been the Millers’ standout player this term and has seen his form rewarded with a call-up to the Nigeria squad. The centre-half looks every inch a top-end Championship player, but with more than 18 months to run on his contract, any suitor would have to be prepared to pay big in January if they want to prize him away. There is no suggestion that any bids are forthcoming and Warne is revelling in his club’s position of strength. “As we’re speaking now, we’re just saying we think he’s great, it doesn’t mean everyone outside of our club does,” he said. “We don’t need the money. We don’t need to sell to stay afloat. It’s an offer we really can’t turn down or he stays. “Until Semi knocks on my door and says he doesn’t want to be here, I don’t see it being a massive problem.We deal with him every day. We’re close to all of our players. If an opportunity comes that is good for them and good for the club, I won’t stand in their way. “We’ve run a pretty tight financial ship here. It’s not like the chairman says we need to sell to make ends meet. It would have to be a real offer to tempt us. Ajayi has not only excelled in defence for the Millers this season, he was also bossing a defensive midfield role prior to an injury crisis which saw him moved back. And Warne would like to get him back into the engine room at some point. “The best Semi is a formidable defender,” Warne said. “His pace gets him out of trouble and he’s got a real football intelligence.